9.45 am: a 3-hour city tour of Moscow featuring city’s most noteworthy landmarks including Red Square with St. Basil’s Cathedral, Kremlin walls, Moscow State University with the best view of the city from the observation platform. In the afternoon travel several stops by Moscow metro to visit the impressive Memorial Museum of Astronautics. 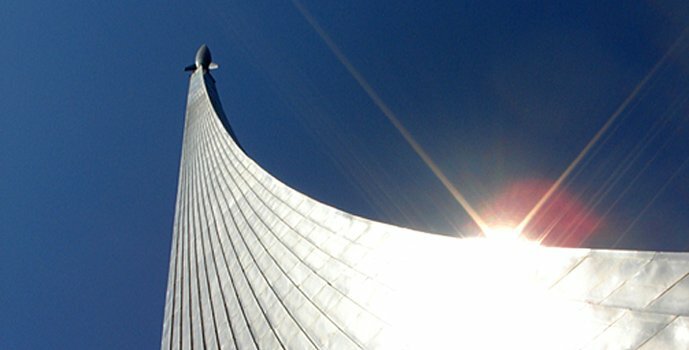 The museum charts the history of the Russian space race. Located inside an enormous monument To Space Explorers, is the museum, the only one of its kind, and is well worth the visit, both for kids and grown ups. The sculpture-lined Cosmonauts Alley is connected with the Moscow metro. The sculpture that tops the museum is one of the key landmarks of the city alongside the All-Russia Exhibition Grounds near by. 9 am: a tour of the Kremlin Grounds, the political, geographic and cultural centre of Moscow and of the whole of Russia.